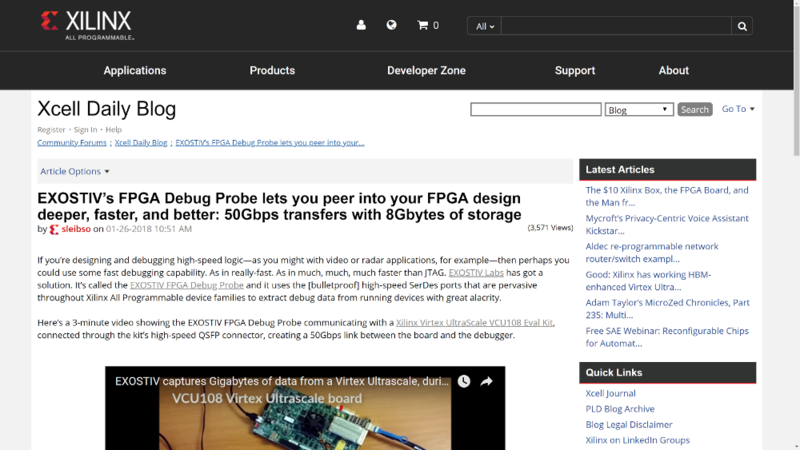 Exostiv Labs – Visibility into the FPGA. See EXOSTIV live - Check our upcoming Webinars now! The ability to see inside the chip is the way to build better design. EXOSTIV™‘s unique structure allows capturing up to 200,000 times more of FPGA operation time than standard embedded instrumentation tools. EXOSTIV™ reduces the ‘guess work’ by capturing extended observation windows and makes more likely to see rare or non-repeating event. EXOSTIV™ increases your observation capability by several orders of magnitude. You get a better understanding of your state machines, controls and data flow.